Being a crossword compiler myself (see my crossword pages), I was very keen to include this book with my reviews. 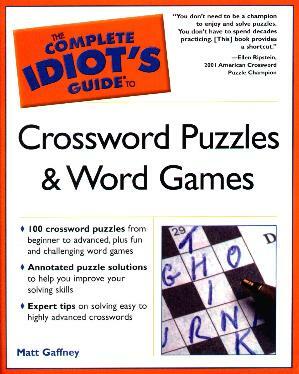 Admittedly, I am not a great puzzle solver, and author Matt Gaffney says, "If you're interested in crosswords but have never quite been able to puzzle them out, this book is for you!" I think many crossword puzzlers attempt, or at least aspire to, completing one in ink. He has given us 100 puzzles to try, as well as Word Games and Quick Quads (fun). Puzzle-solving Tips, Basic, Intermediate, Advanced, and Highly Advanced crosswords are also included. Cryptic Crosswords, Acrostics, and Cryptograms are also covered. Essentially, this book is a shortcut to puzzle solving. People do crosswords for various reasons: Mental challenge, to pass the time on a train or at an airport, socially with a friend, to improve their vocabulary and knowledge, or a way to start their day. This book offers hints on how to solve clues (what to look for); the meaning of words that compilers like to use, as well as "cheating". Acrostics never appealed to me in the past as I didn't know how to do them - they're explained in this book. The solutions to the puzzles come with an explanation of the clue at the back of the book - you'll get to see how the clue was formed. The puzzles I tried were a lot of fun without being too cryptic or too difficult - I have to admit I didn't try the Highly Advanced! There's nothing like successfully completing a crossword puzzle - you see people from all walks of life doing them, anywhere, anytime. Conclusion - Very useful - maybe I'll try compiling a differently themed crossword puzzle, even though I prefer asymmetrical grids.